A few weeks ago I was sitting at 100 Mile Table smashing away at my keyboard when I eavesdropped on a conversation. To my immediate left were two beautiful women, one talking about how a group she was a member of struggles to get press. I politely interrupted, introduced myself, and said I would be proud to publish her story if she would be kind enough to send it to me to share with you all. Here is the email I received from Jan this afternoon. Love your work Jan! Thank you for sharing. G’day Kirra, who has asked what our caring, silver-haired, grandmothers movement is all about! We don’t find this work easy, in fact, it can be very confronting at times; however, each and every one of us is committed to our mission statement. 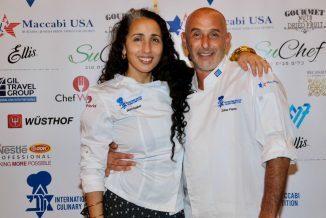 To free the refugee children held in detention! Our mission is to demand freedom for all refugee children held by, or on behalf of, the Australian Government. 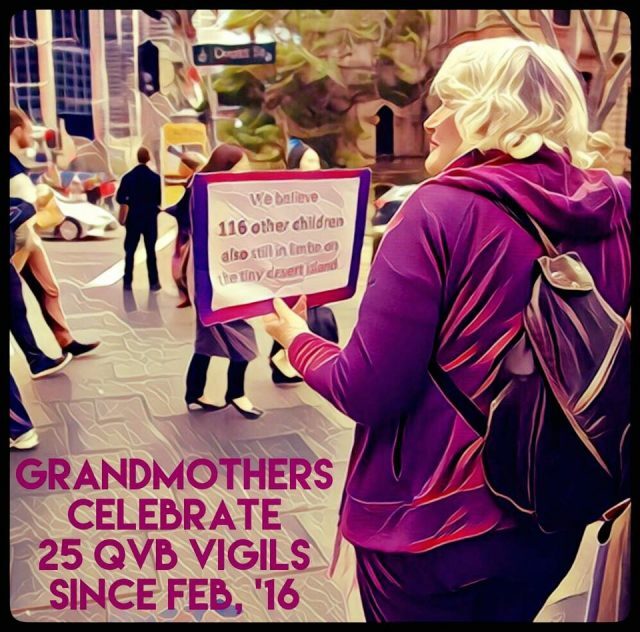 Our mission will not be complete, and we will not stop until every child is removed from the detention centres on the mainland and the Offshore Processing Centres on Nauru. We will also continue to advocate for a better future for the children released from these Processing Centres into the local communities. This is the essence of our movement. What we need is strong humane leadership, from our elected politicians. I had thought my country would never seek to destroy the lives of vulnerable children! This issue of a deterrent policy for asylum seekers has been shameful for me since the Tampa crisis of 2001. When I lived in Kiama, I joined the RAR, 2003. 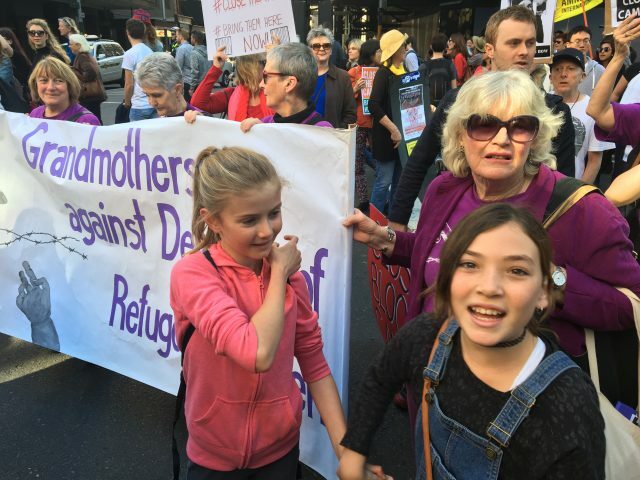 RAR =Rural Australians for Refugees – a grassroots movement is striving to return compassion and humanity to Australia’s treatment of Asylum Seekers. I noted then that we had no law to protect children from being held in detention in Australia. Yes, we had signed up for the U.N Convention on the Rights of the Child, and that was ratified way back in the 1990’s. However, we have no laws to minimise detainment of children on our soil. 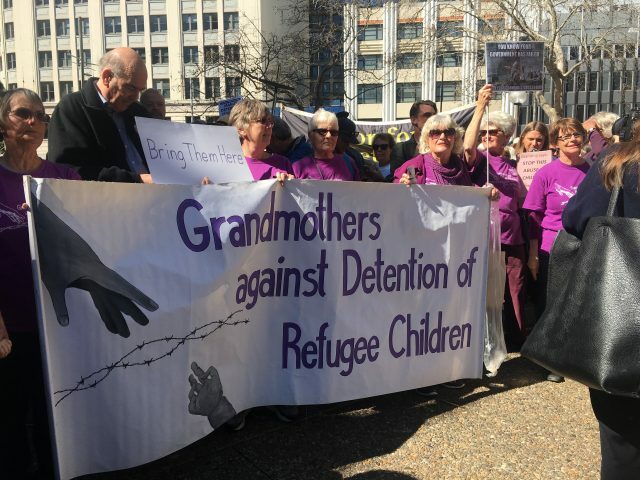 When I moved to Maianbar NSW, I joined a newly formed activist group, 2015 called GADRC ( grandmothers against detention of refugee children), as still could not bear to think of any innocent children losing their freedom. ‘Stop The Boats’ slogan and what that represents has put such fear into ordinary Australian lives that it has allowed an ugly distortion of decent behaviour to suffering human beings, to creep into our society, like a festering sore that appears to be incapable of healing! Immigration policies have deteriorated and become negative, operating at a snail pace for asylum seekers especially. They do not process the paperwork to determine if these people are genuine refugees or not for a very long time; keeping newly arrived asylum seekers offshore without processing, in indefinite detention. 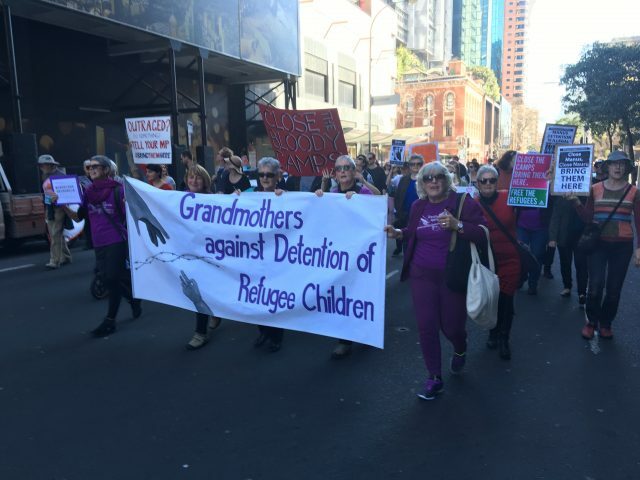 The consequences of indefinite detention for every member of a refugee family, are dire. It means these people have no hope for a decent future and no relief in sight to live a respectable life working for a living to support a family. This process is conducted on isolated Pacific islands ‘out of sight’ with no transparency as to what transpires. In recent years medico’s and support workers, have told of inhumane and cruel treatment as well as sexual abuse of children, often by border protection guards, mentally disturbed inmates, or locals. The United Nations has spoken out about this plight of innocent people, as has our Australian Human Rights Commission. It appears we do not have adequate laws to protect children from being detained. We, as grandmas, who have enriched experiences of love, with our grandchildren cannot understand how our government can allow this hopeless condition to continue indefinitely, for these families. It is painful for us to know of this treatment, with no assistance rendered by our country. We are ashamed of our political leaders, confusing a cruel deterrent policy, with strong border protection. These issues are entirely separate. It is possible to have strong border protection alongside treating innocent people who need protection in an honourable manner. We feel obligated to continue to put pressure on our government to BRING them here; we demand the release of these children with their families, into our community. Because this wound has festered so badly the leaders feel they will lose face if they ‘Bring Them Here’; at this stage, is it possible as a nation, to change our policy, to one of healing? Our group has grown in numbers, across the country. Our ages range from young grandmothers to woman in their nineties! We demonstrate at rallies, we hold vigils weekly, and during the elections in all the marginal electorates. We grandmothers hired two full busloads, plus a cavalcade of cars in March. We took a freedom ride rally to Parliament house and all dressed in purple, we met there, with many individual MP’s. We broke into poignant song in the marble foyer of the new Parliament House, in our final hour of visiting. We have guest speakers nurses, lawyers, cleric’s, doctors, support workers of refugees’, who give us first-hand knowledge of the dysfunctional camps on these islands. We have shown documentaries in public libraries, and in cinemas e.g. “Freedom Stories”…..”Chasing Asylum”…..to educate the public re the actual story of the situation on offshore detention. Indonesia, Bali, Nauru, Manus Islands, ( the latter now has all males, here, languishing), all have detainees. Although children have been known to be abused, on a regular basis, it is worse than this! The mentality is to select & deter the vulnerable; to suit the needs of the strong. Our aim is to change the attitude of the bipartisan support for secrecy and to demonstrate our authenticity for the care of human life. But most importantly to protest visibly, so that people will rise up questioning and demanding by signing petitions, as is happening already giving people the will to find out the truth and deplore the deceit and lies we are being fed by our politicians. Medicos, Teachers, Refugee Action Coalition, Get Up, Amnesty International, Love Finds a Way, to name but a few, are collaborating much more efficiently now, hopefully, to succeed in being advocates for change! Have compassion for your fellow man. Embrace humanitarian value! We need to share this planet to secure, joy and harmony within our universal society. 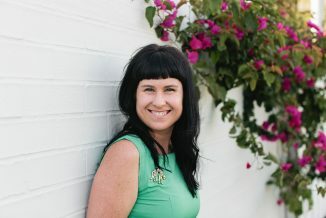 Kirra Pendergast is the editor of Common Ground Australia. 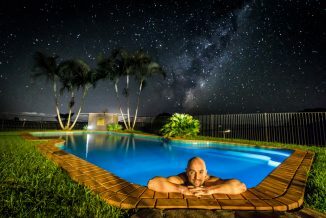 An award winning photographer, Kirra first picked up a camera at 12yrs old. Her photography has been widely published in everything from international newspapers through to Rolling Stone Magazine (which was a major bucket list tick) Kirra is always out capturing photographs of things as varied as the immense power and beauty of the ocean, storms, and the breathtaking landscapes of Northern NSW. Kirra's photographic passion is music, portraiture and street photography. 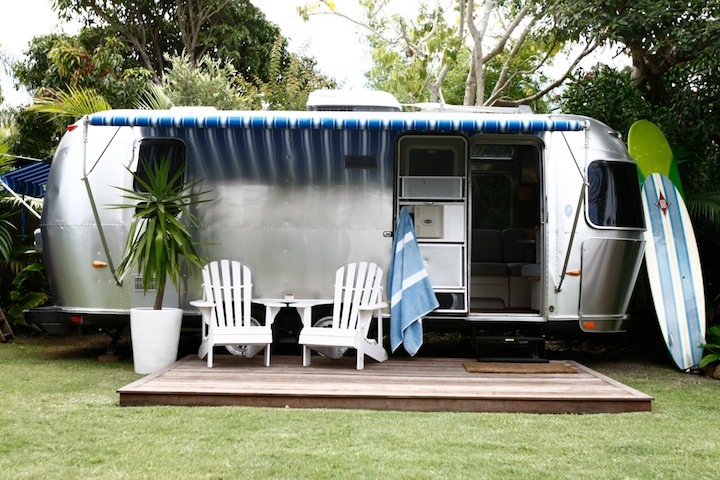 Born and raised in Byron Bay, Kirra's family has spent generations in the Northern Rivers hailing from Lismore, Tuntable Falls, Tregagle and Byron Bay. 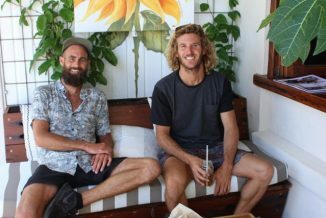 Kirra is passionate about supporting local music, creatives, the arts and local business using Common Ground as a platform to promote this place, its people and their passion. People to know – Summer Maughan from Mate4Life!